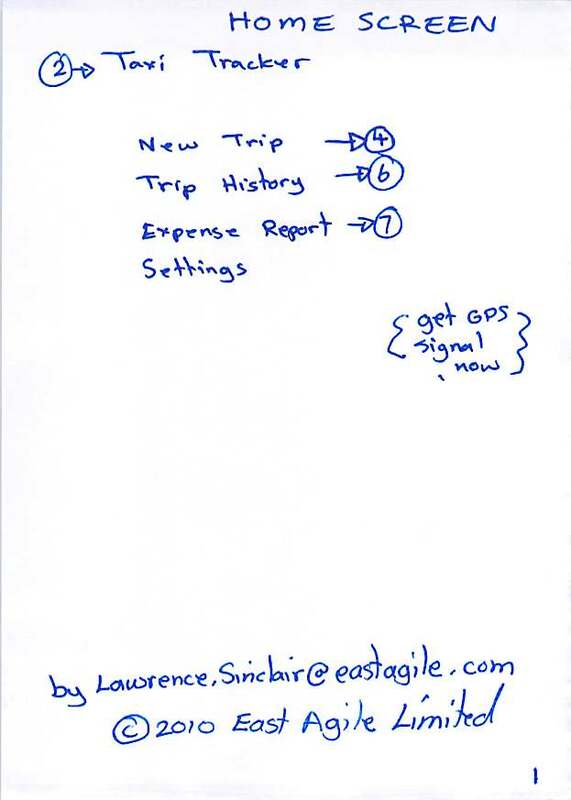 The following cards define the specification for a simple taxi cab trip tracking application for a mobile phone platform. This is the sort of thing we could implement easily across multiple platforms (iPhone, Android, Blackberry, Symbian, and Palm WebOS) using custom code and tools like Rhomobile's Rhodes framework. Look at these cards from two perspectives. First, what do you think of the idea? If a lot of people like it, we might make it. Second, consider that this is typical of the detail we need before we start working with a client to begin an engagement. We would take diagrams like these, break them into small, prioritized user stories and features, then start development that same afternoon. This is the main screen for the application.